Summer has been good to us this year. Plenty of warm days and lots of sunshine have made for great beach days and comfortable water temperatures. If you are anything like me, the floor of your vehicle now has enough sand to fill a decent-sized sandbox. This area is known for its white sand beaches and water sports, but what do you do when everyone is sunburned, waterlogged, or your beach plans simply get rained out? We have some ideas! The Benzie Area Historical Museum is another great option, with hours from 11 a.m. to 5 p.m. every Tuesday through Saturday and family-friendly events such as “Pirates in Benzie” and “I was the only 4th Grader,” which includes stories and photos from former students and teachers of historical one-room schoolhouses. The Garden Theater in Frankfort, built in 1923, has seen ongoing renovations to its art-deco decor over the past decade, and it is really looking beautiful! The Garden provides sheltered entertainment every day of the week with a double feature on Saturdays and Sundays. Ask for “real butter” added to your popcorn: a special treat! If the kids are begging to swim, but there are thunderstorms at the beach, try the Best Western in Beulah! The pool is open to the public for $8 per person. You mean the ski hill? Yes, the ski hill! During the summer, Crystal Mountain Resort in Thompsonville offers an incredible variety of summer activities, including The Crystal Coaster (a slide down the ski hill), The Park at Water’s Edge, the Edge Adventure ropes course, mountain biking, paintball, disc golf, and a climbing wall. The Oliver Art Center in Frankfort is another great, recently renovated space. The building dates back to 1934 and was used as the Coast Guard station until they consolidated and moved into the building across the street. You can check out the upstairs, where the classrooms now are, to pretend that you were a Coastie living in the building. You can also participate twice a week: open art studio on Wednesdays from 10 a.m. to 4 p.m. with a $2 a donation, and open clay studio on Thursdays from 3-6 p.m. with $60 fees covering one adult and one child for four visits (a total of 12 hours, used as you like). It can be as fun or focused as each student prefers, and all skill levels should consider taking part! 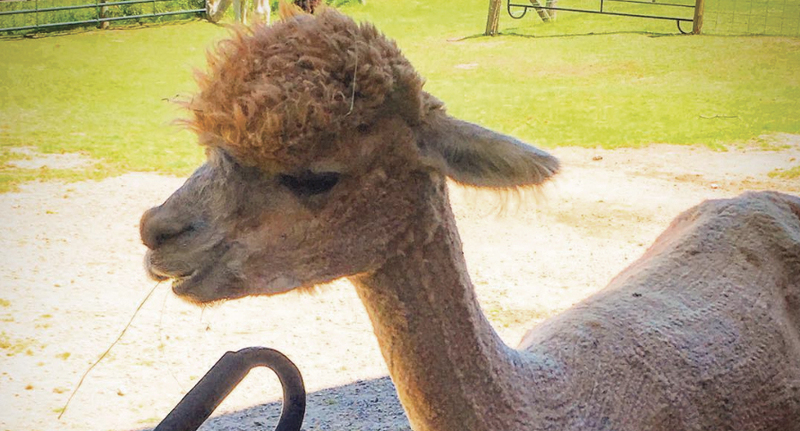 For your first stop, turn into the Crystal Lake Alpaca Farm at 4907 River Road to see adorable adult and baby alpacas grazing on lush green grass or relaxing in the shade of their barn. Make sure to step inside the Alpaca Boutique to admire the beautiful products, made from incredibly soft alpaca fur. Next, take a right out of the farm and drive 4.5 miles, until you see signs for Gwen Frostic Prints, the former home of the world-renowned artist at 5140 River Road. There is a “living roof” with moss and other plants on the building’s exterior, and the inside has working fountains. My son calls it “the hobbit house,” and if you visit, you will see why. Make sure to check out the print shop, where there are often people working on vintage machines that church out the beautiful nature-inspired stationery that you can purchase to write to a pen pal or an overseas grandma. Browse the bird carvings displayed throughout the store. Continue your drive for 1.2 miles further and then turn right at 6289 River Road to visit BeeDazzled for some organic, hand-made soaps, candles, and natural body care products. The complex is the brainchild of Kirk and Sharon Jones, one of their three Benzie businesses dedicated to bees. (Read our story on The Joneses here.) Sharon raises bees on site, and she grows a garden of bee-preferred flowers that you can tour. Have you ever had the sensation of rolling uphill backwards? You can do that by visiting a spot that is known to Benzie County locals as “gravity hill.” Throw your car into neutral at a certain spot along Putney Road, near the Blaine Christian Church, and experience this strange sensation for yourself! For the garden lovers, there are some wonderful options. The Betsie River Centennial Lily Farm, located at 17745 Moore Road in Thompsonville, offers group tours to admire hundreds of varieties of lilies. Keep an eye out for glass and steel garden art, made right on the farm! The Sleeping Bear Dunes National Lakeshore offers a variety of indoor and outdoor spots to visit on any summer day, whether or not it’s a good beach day. Glen Haven’s Maritime Museum (alias the “Coast Guard station”) has been restored to resemble what it was about 100 years ago, so you can pretend that you lived there as a sailor. Then go outside and witness a lifesaving demonstration—complete with firing a real cannon—called “Heroes of the Storm,” which takes place daily at 3 p.m. Half of a mile to the east is the restored village of Glen Haven, including a pictorial museum, the boathouse, and a blacksmith’s shop—all with Park volunteers, happy to tell you about the way things were and how things worked way back when. Head south on M-109 past the Dune Climb (if you can do that without the obligatory stop) to the Village of Empire, where you will hang a left onto M-72 and then another left into the parking lot of the Philip A. Hart Visitor Center, where you can obtain park passes, maps, and brochures. See lifelike displays of natural fauna and geological forms from our area. Watch fascinating movies and videos, such as one about how the dunes and lakes were formed by the glaciers. Enroll your kids in the Junior Ranger Program; if they complete enough of the prescribed activities, they become junior rangers and earn a badge and/or a patch. You can also attend ranger-guided kayak trips, bike rides, and hikes, but call ahead for a reservation. Evening programs occur every night at 8 p.m. at the Platte and D. H. Day campgrounds or, in the case of rain, at the D. H. Day log cabin—the 45-minute presentations are provided by rangers who speak on a variety of topics, from lighthouses and maritime history to cultural history and natural history. There are also evening hikes at the different trailheads, as well as various other outings. A monthly solar viewing occurs from 4 to 6 p.m. followed by “star parties” from 9 to 11 p.m. for those who can stay up late. Check the Visitor Center for a schedule of the week’s activities. If you are in the mood to just stay home but still need some ideas to keep the kids entertained, I asked members of one of our local playgroups for their favorite rainy day activities. Answers included a family talent show, fort building, family game or puzzle day, and watercolor paints on the driveway! I know some days as a parent feel like the postman’s creed, “Neither snow, nor rain, nor heat, nor gloom of night” shall keep you from being called upon by multiple energetic and enthusiastic people to provide food, as well as entertainment. Hopefully, this will help! Feature photo: Crystal Lake Alpaca Farm and Boutique. Photo by Stephanie Ong.